Seeing as we've had a pretty good run of some fabulous headphones lately and finding that Audio-Technica had a model at nearly twice the price, we were more than merely curious. On arrival, the W5000 turned out to be one of the most glamorously packaged bits of hi-fi around. Housed in a plastic case, the interior of which is lined with red satin gave the product the appearance of some exceptionally rare wine or piece of antique jewellery. But we want more than a nice presentation, we want quality. And the official description of the W5000 suggests there's plenty of that built in, from ebony ear cups to '8-nines' copper wire in the voice coil windings. As with the W1000, the ear cups are closed, making this a slightly more noise-blocking model than, for instance, upmarket Grados and Sennheisers. 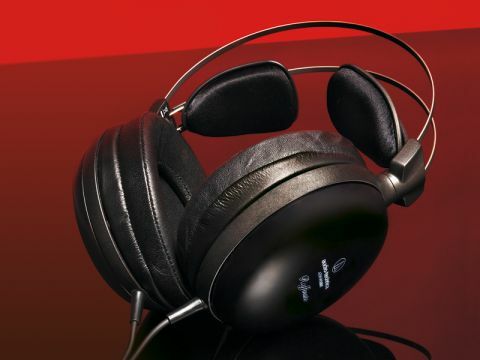 The seal to the ears is leather-lined, soft and comfortable, with support provided by an ingenious 'wing' headband, while the cable, a feature we criticised on the W1000 for transmitting frictional noise, is fairly flexible and considerably less noisy. The heart of any headphone is, of course, the drive unit in each earpiece and these are 53mm-diameter types with a neodymium magnet. Audio-Technica gives no detail about the cone material, but the quoted treble response of 45kHz suggests it's something light. At the other extreme, bass is quoted to 5Hz, aided by a 'double air damping system' which presumably helps prevent bass resonance, one possible pitfall of closed-back headphones. Not that you'll hear 5Hz, of course.... Weight is a little on the high side at 340g, but we found long-term use very pleasant. In many ways, this is an admirable transducer. The relatively high sensitivity took a bit of getting used to, but even after we'd adjusted our usual headphone amplifier settings we found that some kinds of high-frequency detail seem to stick out more than usual. This is only partly due to the W5000's slightly treble-rich balance and certainly bears tribute to the quality of the drive units. Of course, not all such detail is welcome, but at any rate you'll soon know if your favourite recordings are contaminated by buzzy hum, minute clicks or audible breathing from the backing band! Despite that, detail is not always as good as one might like. When music gets dense and loud, the texture heard through the W5000 thickens considerably and the ultimate resolving power seems to us some way short of what we've heard from other high-end headphones. We'd wager that this is due to something in the design which contributes a very prolonged resonance. We noticed this by tapping the earcups with a fingernail while wearing the headphones, with no music playing. This simple test can be very revealing: ideally there should be a simple click of no distinct tone, followed by silence. With this model, there was a long (more than one second) tail of resonance, which must surely be excited by music and will then proceed to colour the sound considerably and muddy detail. The midrange and bass are certainly glorious and simple music is quite beautiful, giving a real life and energy to the bass, with sudden dynamic contrasts feeling very exciting. Whilst this is a good heaphone offering high undistorted listening levels, on the whole, we prefer Audio-Technica's excellent ATH-W1000 at £400.